Detritivores, also known as detrivores, detritophages, detritus feeders, or detritus eaters, are heterotrophs that obtain nutrients by consuming detritus (decomposing plant and animal parts as well as faeces). There are many kinds of invertebrates, vertebrates and plants that carry out coprophagy. By doing so, all these detritivores contribute to decomposition and the nutrient cycles. They should be distinguished from other decomposers, such as many species of bacteria, fungi and protists, which are unable to ingest discrete lumps of matter, but instead live by absorbing and metabolizing on a molecular scale (saprotrophic nutrition). However, the terms detritivore and decomposer are often used interchangeably. Detritivores are an important aspect of many ecosystems. They can live on any type of soil with an organic component, including marine ecosystems, where they are termed interchangeably with bottom feeders. 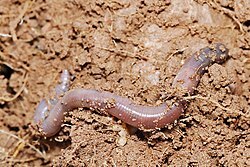 Typical detritivorous animals include millipedes, springtails, woodlice, dung flies, slugs, many terrestrial worms, sea stars, sea cucumbers, fiddler crabs, and some sedentary polychaetes such as amphitrites (Amphitritinae, worms of the family Terebellidae) and other terebellids. Scavengers are not typically thought to be detritivores, as they generally eat large quantities of organic matter, but both detritivores and scavengers are same type of cases of consumer-resource systems. The consumption of wood, whether alive or dead, is known as xylophagy. Τhe activity of animals feeding only on dead wood is called sapro-xylophagy and those animals, sapro-xylophagous. Fungi are the primary decomposers in most environments, illustrated here Mycena interrupta. 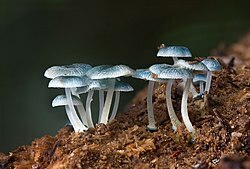 Only fungi produce the enzymes necessary to decompose lignin, a chemically complex substance found in wood. In food webs, detritivores generally play the roles of decomposers. Detritivores are often eaten by consumers and therefore commonly play important roles as recyclers in ecosystem energy flow and biogeochemical cycles. Many detritivores live in mature woodland, though the term can be applied to certain bottom-feeders in wet environments. These organisms play a crucial role in benthic ecosystems, forming essential food chains and participating in the nitrogen cycle. Fungi, acting as decomposers, are important in today's terrestrial environment. During the Carboniferous period, fungi and bacteria had yet to evolve the capacity to digest lignin, and so large deposits of dead plant tissue accumulated during this period, later becoming the fossil fuels. A decaying tree trunk in Canada's boreal forest. Decaying wood fills an important ecological niche, providing habitat and shelter, and returning important nutrients to the soil after undergoing decomposition. By feeding on sediments directly to extract the organic component, some detritivores incidentally concentrate toxic pollutants. ^ "Nitrogen in Benthic Food Chains" (PDF). Archived from the original (PDF) on 2007-06-10. , Tenore, K.R., SCOPE publication.